Planned production is often compromised by unplanned Downtime incidents and sub-optimal production rates that are not quantified in terms of Time, Rate Loss and the associated Reasons. Without this quantifiable information there is no way to consistently identify potential Downtime causes and to assign activities to make the necessary improvements avoiding future lost production. Exaquantum/DTA (hereafter known as 'DTA') is Yokogawa's Down Time Analysis solution. Based on the need to log and track unplanned equipment Downtime, DTA automatically captures plant data to enable Downtime analysis to be carried out. The system records times when plant equipment is not running ('Downtimes') and production figures which are less than the Maximum Sustainable Production Rate ('Rate Losses'). Reasons can then be assigned to these events to add context. The resulting statistics are integral to the operational decision making process with a view to minimizing plant loss and maximizing future production. A Plant will have one or more Production Units that are expected to be in constant production. Any interruption to production is considered Downtime, with an associated Loss. 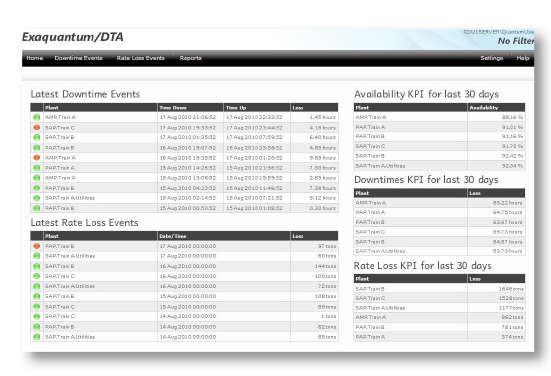 Downtime Loss is automatically collected and registered in DTA on a per-Unit basis. Downtime Loss is a measure of production loss when a Production Unit is Down, measured in time. 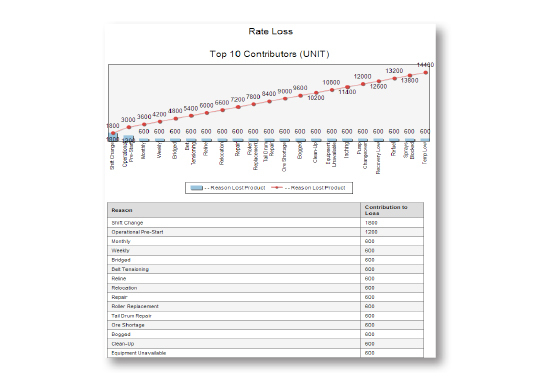 Rate Loss is a measure of production loss when the Production Unit is Up, calculated in Units/Hour. Rate Loss is the loss of production due to sub-optimal operating conditions. Standby is a measure of the time a piece of equipment is ready to run but is prevented from doing so by another piece of equipment being Down. The collection of standby data is optional and is available for collection on any equipment within the plant hierarchy. Downtime Loss (Hours) can be translated into an equivalent Units/H, and Rate Loss (Units/H) can be translated into Hours allowing total loss to be represented by either Hours or Units/H. Plant and Reason hierarchies are used for both selection, aggregation and reporting purposes. The assignment of Reasons to Losses can be made by one or more users. There may be multiple Reasons associated with each Downtime occurrence and therefore the ability to weight Reasons is provided. For example, Reason A may be responsible for 60% of the Downtime and Reason B responsible for 40% of the Downtime. The weighting can be entered as either a percentage of the total Downtime or an actual time duration. If a day boundary is crossed these weightings will get allocated pro-rata for each day. To aid in the allocation of Reasons to Downtimes, a record of the 'First Out Stop' equipment and cause may be collected and linked to the Downtime event. There may be multiple Reasons associated with each Rate Loss occurrence and therefore the ability to assign percentage allocations to each Reason is provided. For example, Reason A may be responsible for 20% of the material loss and Reason B responsible for 80% of the material loss. Web based access means there is no need for the installation of specific client software. In addition, custom KPI's can be engineered and added to the overview screen and summary reports. The Rate Loss Events are presented as a user selectable filtered view with additional drilldown for detailed information. Selecting a Rate Loss Event provides the user with the details of the event along with associated Reasons. Multiple Rate Loss Reasons can be assigned and edited for a Rate Loss event. The Downtime Events are presented as a selectable filtered view with additional drilldown for detailed information. Selecting a Downtime Event provides further details and any assigned Reasons. Multiple Downtime Reasons can be assigned to a Downtime Event. The PCS Stop cause and PCS Stop equipment, if configured for collection, can also be viewed. Downtime, Rate Loss and Total Availability for a requested period are aggregated up through the units of the Plant Hierarchy. The Summary Report is able to show this information against the expanded Plant Hierarchy. Selection of any Plant Hierarchy node generates a Reason Classification Report for the selected node and period of interest. This allows users to explore detailed information using drilldown through different time periods, Plant Hierarchy and Reason Hierarchy to identify cases that are the most deserving of corrective action. The Downtime Equipment Ranking and Rate Loss Equipment Ranking Reports split ranking down into combinations of equipment and allocated reason. 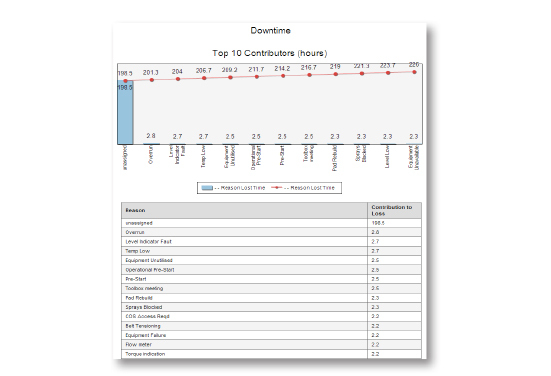 From the Downtime, Rate Loss, Downtime Equipment, or Rate Loss Equipment Ranking reports further drilldown is possible to a detailed event report, showing the individual Downtime and Rate Loss events that contributed to the totals in the ranking report. The Downtime and Rate Loss associated with Reasons are aggregated up through the nodes of the Reason Hierarchy. 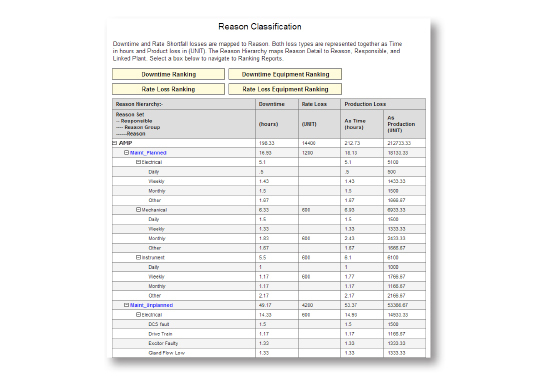 The Reason Classification Report displays this information against the expanded Reason Hierarchy. From the Reason Classification Report, four more reports can be drilled down to; Downtime Ranking, Rate Loss Ranking, Downtime Equipment Ranking, and Rate Loss Equipment Ranking, with worst offending Reasons listed in contribution order. 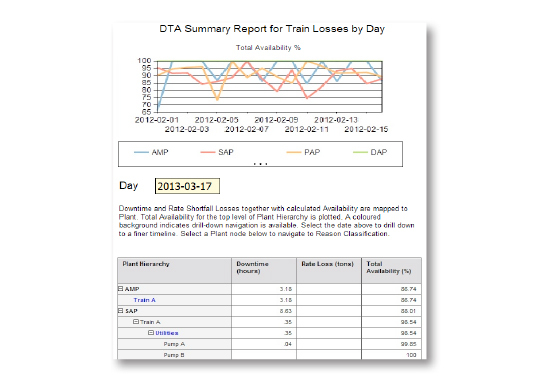 Exaquantum/DTA's Downtime and Rate Loss data and any assigned Reason data can be accessed from Microsoft Excel. Administrators can also create new reports in SQL Server Report Builder to supplement the standard reports. Administrator created Custom reports can be scheduled for emailing. Exaquantum/DTA collects production data from OPC DA 2.05a and HDA 1.1 servers, such as Yokogawa's 'Exaopc' or OPC servers provided by other suppliers.